It's officially October and time to say goodbye to summer! October is here! One of my favorite things that I did this summer was my (near-) weekly trip to the Sunday farmer's market. All the produce was fresh and ready to sell. All the prices were right because the vendors wanted to get rid of everything in time for new produce for next weekend! With the produce, I would make tons of salads incorporating fresh fruit. 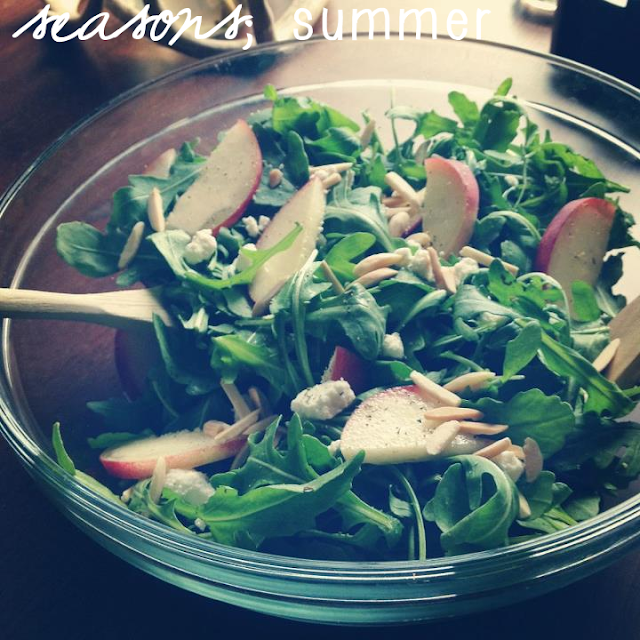 A hit was arugula, goat cheese, peach, and toasted almond salad with a fig infused balsamic dressing. Such a wonderfully rich salad! Me too! I'm ready for fall soups instead of summer salads! wow that salad sounds so good! i am all about fruit and goat cheese in my salads. we would definitely get along famously!! Goat cheese is my absolute favorite - I find any excuse I can to put it in a meal! I bet this salad is a hit. Sounds great. The great thing about any season ending is the excitement for the next one. It has been in the 90's up until this week in Reno. Yay Fall!!! Florida has held on strong to temperatures in the 90's still as well! I'm can't wait until it's cool enough to open some windows for a cool breeze and fresh air! I absolutely love fresh produce! There's so much fun in bringing home what's in season because pretty much no matter what is cooked with it, it will tastes its absolute best!